A northern resident killer whale pod (orcas) enjoying a beautiful sunset in a resting line in Johnstone Strait, British Columbia, Canada. Photographing killer whales for almost 25 years gave me many opportunities to get a good insight of an orca's "life". I saw them jumping (breaching), spy-hopping and racing, I saw transient killer whales chasing and killing dolphins but I also saw transients play. In short, I saw a lot of different behaviour and situations with my all time favourite (with bears) animals. If one asked me today what I enjoyed most photographing them, then I have to point them to this picture which is for myself one of my very favourite ones. A peaceful setting in Johnstone Strait, just a few ripples on the water, the sun just set and turned the sky into beautiful colours and a family of resident orcas resting. One of my favourite settings for sure. What the whales offered me in this shot was the big bonus, the "cream on top of a desert", which was one of them spy-hopping to make this shot perfect. Perfect for me anyway! ... I very well remember my guests too as they just stood on the boat, we had the engine off and they just simply enjoyed this unique situation. 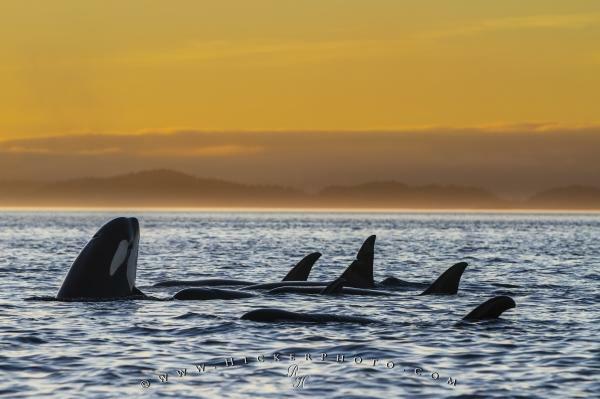 Family pod of northern resident killer whales snoozing in a so called resting line in Johnstone Strait, Vancouver Island, British Columbia, Canada. I photographed this photo with the digital SLR camera model Canon EOS 7D, aperture of f/5.0, exposure time of 1/1000 sec. on ISO 400, as always I used a original Canon Lens, the focus lenght for this picture was 160mm.